You are currently browsing the category archive for the ‘MDM’ category. In my earlier post The weekend after PDT Europe I wrote about the first day of this interesting conference. We ended that day with some food for thought related to a bimodal PLM approach. Now I will take you through the highlights of day 2. 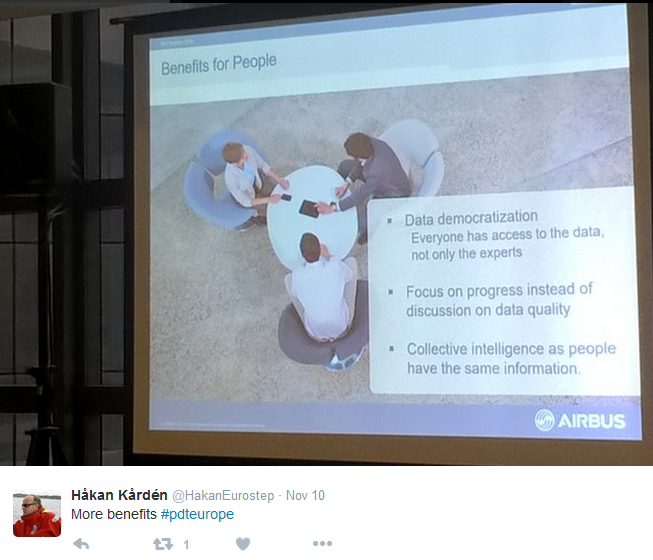 I believe Airbus and Boeing are one of the most challenged companies when it comes to PLM. They have to cope with their stakeholders and massive amount of suppliers involved, constrained by a strong focus on safety and quality. And as airplanes have a long lifetime, the need to keep data accessible and available for over 75 years are massive challenges. The morning was opened by presentations from Anders Romare (Airbus) and Brian Chiesi (Boeing) where they confirmed they could switch the presenter´s role between them as the situations in Airbus and Boeing are so alike. Anders Romare started with a presentation called: Digital Transformation through an e2e PLM backbone, where he explained the concept of extracting data from the various silo systems in the company (CRM, PLM, MES, ERP) to make data available across the enterprise. In particular in their business transformation towards digital capabilities Airbus needed and created a new architecture on top of the existing business systems, focusing on data (“Data is the new oil”). In order to meet a data-driven environment, Airbus extracts and normalizes data from their business systems and provides a data lake with integrated data on top of which various apps can run to offer digital services to existing and new stakeholders on any type of device. The data-driven environment allows people to have information in context and almost real-time available to make right decisions. Currently, these apps run on top of this data layer. Now imagine information captured by these apps could be stored or directed back in the original architecture supporting the standard processes. This would be a real example of the bimodal approach as discussed on day 1. As a closing remark Anders also stated that three years ago digital transformation was not really visible at Airbus, now it is a must. Interesting part of this architecture is that Boeing aims to exchange data with the outside world (customers / regulatory/supply chain /analytics / manufacturing) through industry standard interfaces to have an optimal flow of information. Standardization would lead to a reduction of customized applications, minimize costs of integration and migration, break the obsolescence cycle and enable future technologies. Brian knows that companies need to pull for standards, vendors will deliver. Boeing will be pushing for standards in their contracts and will actively work together with five major Aerospace & Defense companies to define required PLM capabilities and have a unified voice to PLM solutions providers. My conclusion on these to Aerospace giants is they express the need to adapt to move to modern digital businesses, no longer the linear approach from the classic airplane programs. Incremental innovation in various domains is the future. The existing systems need to be there to support their current fleet for many, many years to come. The new data-driven layer needs to be connected through normalization and standardization of data. For the future focus on standards is a must. Simon Floyd from Microsoft talked about The Impact of Digital Transformation in the Manufacturing Enterprise where he talked us through Digital Transformation, IoT, and analytics in the product lifecycle, clarified by examples from the Rolls Royce turbine engine. A good and compelling story which could be used by any vendor explaining digital transformation and the relation to IoT. Next, Simon walked through the Microsoft portfolio and solution components to support a modern digital enterprise based on various platform services. At the end, Simon articulated how for example ShareAspace based on Microsoft infrastructure and technology can be an interface between various PLM environments through the product lifecycle. Simon’s presentation was followed by a panel discussion where the theme was: When is history and legacy an asset and barriers of entry and When does it become a burden and an invitation to future competitors. 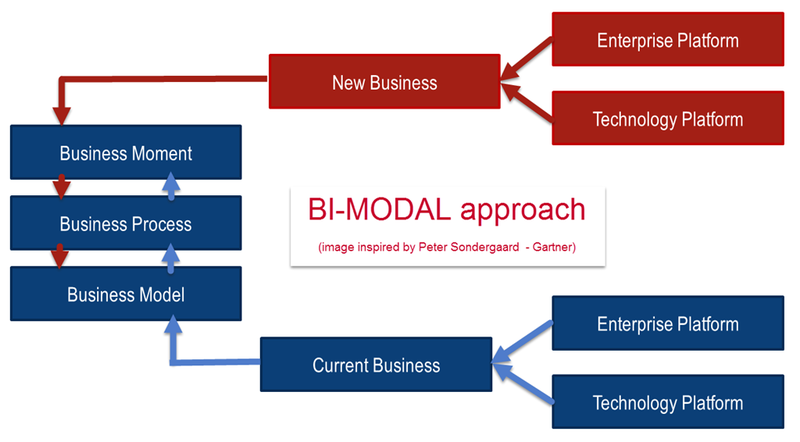 Mark Halpern (Gartner) mentioned here again the bimodal thinking. Aras is bimodal. The classical PLM vendors running in mode 1 will not change radically and the new vendors, the mode 2 types will need time to create credibility. 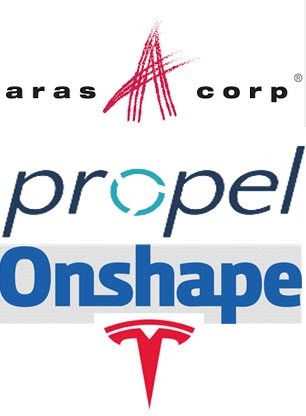 Other companies mentioned here PropelPLM (PLM on Salesforce platform) or OnShape will battle the next five years to become significant and might disrupt. Simon Floyd(Microsoft) mentioned that in order to keep innovation within Microsoft, they allow for startups within in the company, with no constraints in the beginning to Microsoft. This to keep disruption inside you company instead of being disrupted from outside. Another point mentioned was that Tesla did not want to wait till COTS software would be available for their product development and support platform. Therefore they develop parts themselves. Are we going back to the early days of IT ? Interesting trend I believe too, in case the building blocks for such solution architecture are based on open (standardized ?) services. After the lunch, the conference was split in three streams where I was participating in the “Creating and managing information quality stream.” As I discussed in my presentation from day 1, there is a need for accurate data, starting a.s.a.p. as the future of our businesses will run on data as we learned from all speakers (and this is not a secret – still many companies do not act). In the context of data quality, Jean Brange from Boost presented the ISO 8000 framework for data and information quality management. This standard is now under development and will help companies to address their digital needs. The challenge of data quality is that we need to store data with the right syntax and semantic to be used and in addition, it needs to be pragmatic: what are we going to store that will have value. And then the challenge of evaluating the content. Empty fields can be discovered, however, how do you qualify the quality of field with a value. 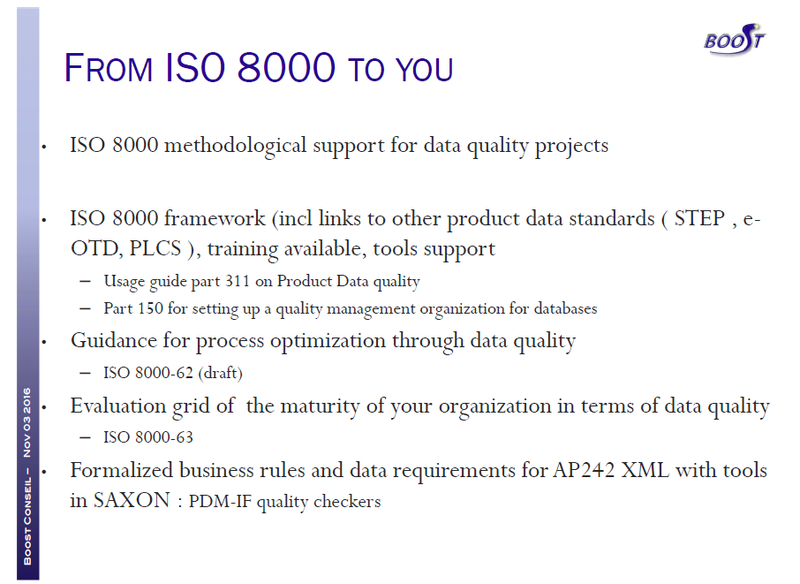 The ISO 8000 framework is a framework, like ISO 9000 (product quality) that allow companies to work in a methodological way towards acceptable and needed data quality. Magnus Färneland from Eurostep addressed the topic of data quality and the foundation for automation based on the latest developments done by Eurostep on top of their already rich PLCS data model. 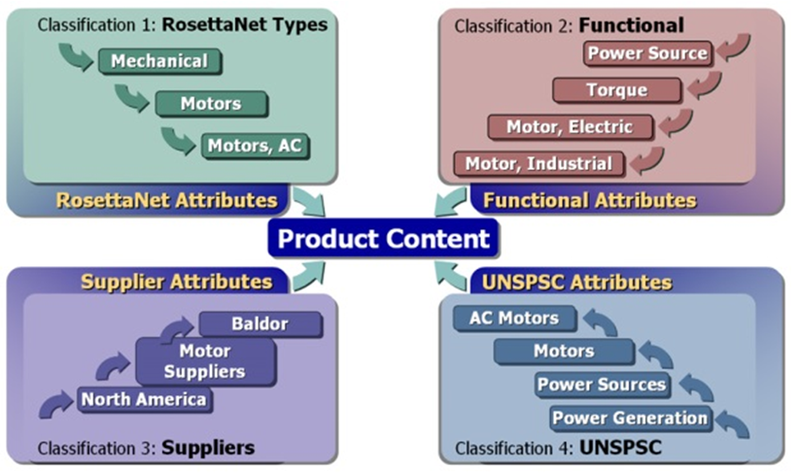 The PLCS data model is an impressive model as it already supports all facets of product lifecycle from design, through development and operations. By introducing soft typing, EuroStep allows a more detailed tuning of the data model to ensure configuration management. When at which stage of the lifecycle is certain information required (and becomes mandatory) ? Consistent data quality enforced through business process logic. The conference ended with Marc Halpern making a plea for Take Control of Your Product Data or Lose Control of Your Revenue, where Marc painted the future (horror) scenario that due to digital transformation the real “big fish” will be the digital business ecosystem owner and that once you are locked in with a vendor, these vendors can uplift their prices to save their own business without any respect for your company’s business model. 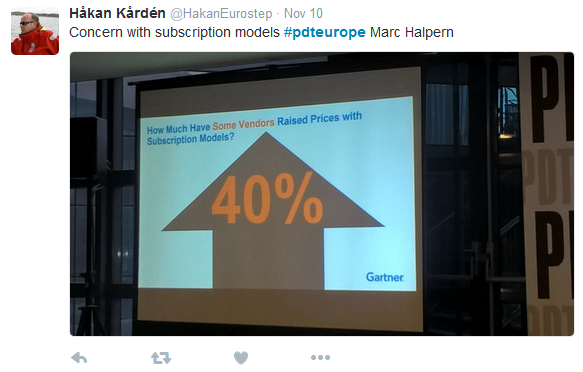 Marc gave some examples where some vendor raised prices with the subscription model up to 40 %. Therefore even when you are just closing a new agreement with a vendor, you should negotiate a price guarantee and a certain bandwidth for increase. And on top of that you should prepare an exit strategy – prepare data for migration and have backups using standards. Marc gave some examples of billions extra cost related to data quality and loss. It can hurt !! Finally, Marc ended with recommendations for master data management and quality as a needed company strategy. Gerard Litjens from CIMdata as closing speaker gave a very comprehensive overview of The Internet of Thing – What does it mean for PLM ? based on CIMdata’ s vision. 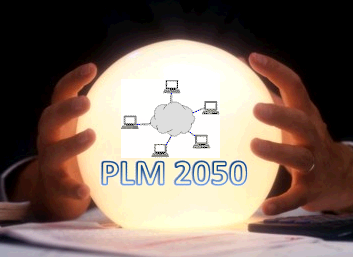 As all vendors in this space explain the relation between IoT and PLM differently, it was a good presentation to be used as a base for the discussion: how does IoT influence our PLM landscape. Because of the length of this blog post, I will not further go into these details – it is worth obtaining this overview. Concluding: PDT2016 is a crucial PLM conference for people who are interested in the details of PLM. Other conferences might address high-level customer stories, at PDT2016 it is about the details and sharing the advantages of using standards. Standards are crucial for a data-driven environment where business platforms with all their constraints will be the future. And I saw more and more companies are working with standards in a pragmatic manner, observing the benefits and pushing for more data standards – it is not just theory. This is for the moment the last post about the difference between files and a data-oriented approach. This time I will focus on the need for open exchange standards and the relation to proprietary systems. In my first post, I explained that a data-centric approach can bring many business benefits and is pointing to background information for those who want to learn more in detail. In my second post, I gave the example of dealing with specifications. It demonstrated that the real value for a data-centric approach comes at the moment there are changes of the information over time. For a specification that is right the first time and never changes there is less value to win with a data-centric approach. Moreover, aren’t we still dreaming that we do everything right the first time. The challenge for a data-oriented approach is that information needs to be stored in data elements in a database, independent of an individual file format. For text, this might be easy to comprehend. Text elements are relative simple to understand. 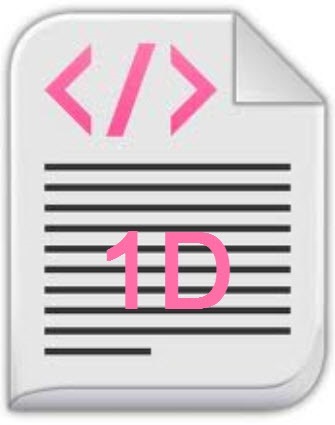 Still the OpenDocument standard for Office documents is in the background based on a lot of technical know-how and experience to make it widely acceptable. For 2D and 3D information this is less obvious as this is for the domain of the CAD vendors. CAD vendors have various reasons not to store their information in a neutral format. First of all, and most important for their business, a neutral format would reduce the dependency on their products. Other vendors could work with these formats too, therefore reducing the potential market capture. You could say that in a certain manner the Autodesk 2D format for DXF (and even DWG) have become a neutral format for 2D data as many other vendors have applications that read and write back information in the DXF-data format. So far DXF is stored in a file but you could store DXF data also inside a database and make it available as elements. This brings us to the second reason why using neutral data formats are not that evident for CAD vendors. It reduces their flexibility to change the format and optimize it for maximal performance. Commercially the significant, immediate disadvantage of working in neutral formats is that it has not been designed for particular needs in an individual application and therefore any “intelligent” manipulations on the data are hard to achieve.. The same reasoning can be applied to 3D data, where different neutral formats exist (IGES, STEP, …. ). It is very difficult to identify a common 3D standard without losing many benefits that an individual 3D CAD format brings currently. For example, CATIA is handling 3D CAD data in a complete different way as Creo does, and again handled different compared to NX, SolidWorks, Solid Edge and Inventor. 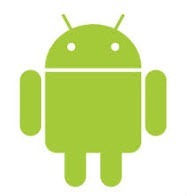 Even some of them might use the same CAD kernel. 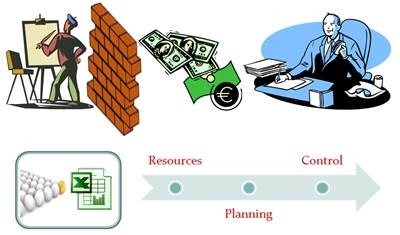 This brings us in the world of data management, in my world mainly PLM systems and ERP systems. An ERP system is already a data-centric application, the BOM is already available as metadata as well as all the scheduling and interaction with resources, suppliers and financial transactions. Still ERP systems store a lot of related documents and drawings, containing content that does not match their data model. PLM systems have gradually becoming more and more data centric as the origin was around engineering data, mostly stored in files. In a data-centric approach, there is the challenge to exchange data between a PLM system and an ERP system. 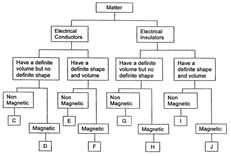 Usually there is a need to share information between two systems, mainly the items. 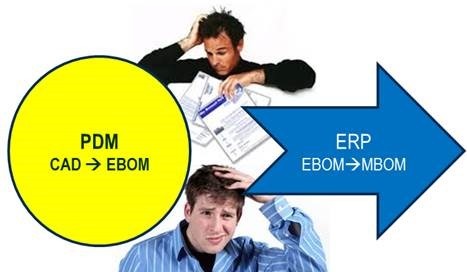 Different definitions of an item on the PLM and ERP side make it hard to exchange information from one system to the other. 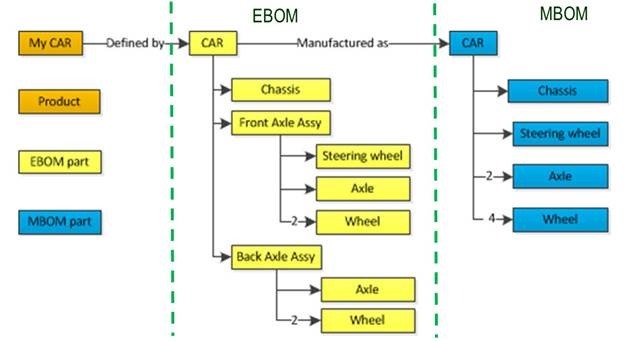 It is for that reason why there are many discussions around PLM and ERP integration and the BOM. 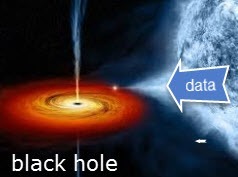 The data-centric approach creates the impression that you can achieve a single source of the truth as all objects are stored uniquely in a database. SAP solves the problem by stating everything fits in their single database. To my opinion this is more a black hole approach: Everything gets inside, but even light cannot escape. Usability and reuse of information that was stored with the intention not to be found is the big challenge here. 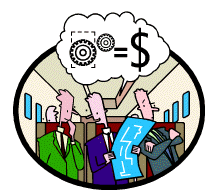 Other PLM and ERP vendors have different approaches. Either they choose for a service bus architecture where applications in the background link and synchronize common data elements from each application. 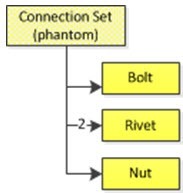 Therefore, there is some redundancy, however everything is connected. 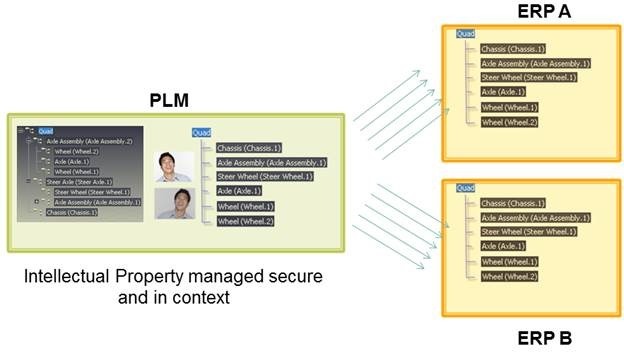 More and more PLM vendors focus on building a platform of connected data elements, where on top applications will run, like the 3DExperience platform from Dassault Systèmes. As users we are more and more used to platforms as Google, Apple provide these platforms already in the cloud for common use on our smartphones. 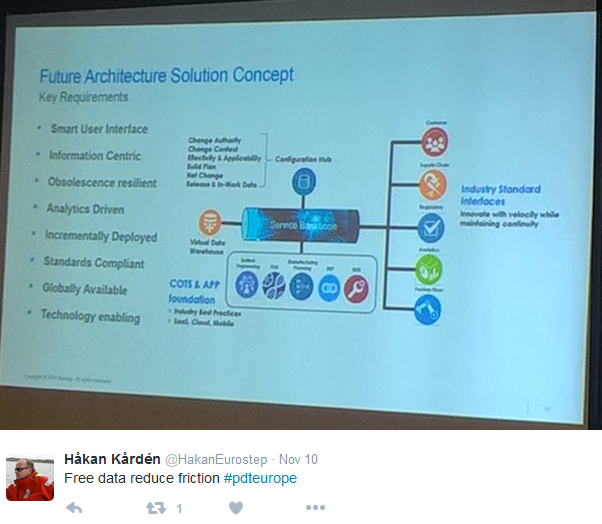 The large amount of apps run on shared data elements (contacts, locations …) and store additional proprietary data. And here we enter an interesting area of discussion. I think it is a given that a single database concept is a utopia. Therefore, it will be all about how systems and platforms communicate with each other to provide in the end the right information to the user. The systems and platforms need to be data-centric as we learned from the discussion around the document (file centric) or data-centric approach. “……. the root cause of all interoperability and data challenges is the need to transform data between systems using different, and often incompatible, data models. It is fundamentally different from the current Application Centric Approach, in that data is SHARED, and therefore, ‘NOT OWNED’ by the applications that create it. Another company in the same domain is Eurostep, who are also focusing on business collaboration between in various industries. Eurostep has been working with various industry standards, like AP203/214, PLCS and AP233. Eurostep has developed their Share-A-space platform to enable a data-centric collaboration. This type of data collaboration is crucial for all industries. Where the aerospace and automotive industry are probably the most mature on this topic, the process industry and construction industry are currently also focusing on discovering data standards and collaboration models (ISO 15926 / BIM). It will be probably the innovators in these industries that clear the path for others. For sure it will not come from the software vendors as I discussed before. If you reach this line, it means the topic has been interesting in depth for you. In the past three post starting from the future trend, an example and the data modeling background, I have tried to describe what is happening in a simplified manner. If you really want to dive into the PLM for the future, I recommend you visit the upcoming PDT 2014 conference in Paris on October 14 and 15. Here experts from different industries will present and discuss the future PLM platform and its benefits. I hope to meet you there.